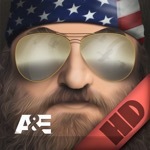 The official mobile game of America’s #1 reality television series, Duck Dynasty, is now available exclusively in the App Store! Its time to ditch your yuppie status and join Duck Dynasty’s Quack Pack, Jack! Game development by A&E Networks and RED Games, a division of RED Interactive Agency. Battle of the Beards tests your reflexes and drops you feet first into the Louisiana backwoods to compete in the Robertson family’s favorite redneck activities. Master sets of rapid-fire micro-challenges, unlocking gear and earning points along the way, to prove you got what it takes to grow a beard as long as your favorite Duckmen. This game has a 4.5 star rating (3831 ratings). It occupies the 29971th position in our ranking with 74 points. It is among the 1% best ones of its category and among the 1% best ones of the overall top.